Murcia - Primarily an agricultural area with many traditional towns inland of much historical interest, located in the southeast of the country between Andalucía and Valencia, on the Mediterranean coast. The coast, Costa Calida ("the warm coast"), on the Mediterranean is a major tourist attraction, with beaches of fine sand and plenty of water sports available. The capital city, Murcia, has many historic attractions. The Autonomous Community of the Region of Murcia (Spanish: Comunidad Autónoma de la Región de Murcia) is one of Spain's seventeen autonomous communities. The region is a major producer of fruits, vegetables, and flowers for Spain and the rest of Europe. Excellent wineries have developed near the towns of Bullas, Yecla, and Jumilla, as well as olive oil near Moratalla. Murcia is mainly a warm region which has made it very suitable for agriculture. However the precipitation level is low and water supply is a hot subject today since, in addition to the traditional water demand for crops, there is now also a demand of water for the booming tourist developments which take advantage of the mild weather and beaches. 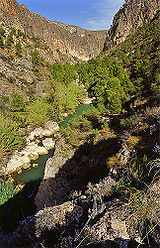 Water is supplied by the Segura River or Río Segura and, ever since the 70's, by the Tajo transvasement, a major civil engineering which, under some environmental and sustainability restraints, brings water from the Tajo into the Segura. The Costa Cálida has 250 km of beaches, from el Mojón at the North near Alicante to Águilas, South West Murcia, near Almería. One of the major destinations of Murcia is the Mar Menor or Small Sea, the largest natural lake of Spain and the largest salty lagoon in Europe, located by the Mediterranean. 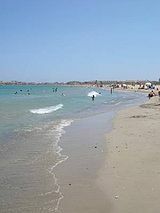 It is separated from the mediterranean by a 22 km narrow sandy strip known as La Manga del Mar Menor or simply La Manga. It is probably the most developed and overcrowded holiday area of Murcia, despite being declared a Specially Protected Area of Mediterranean Importance (SPAMIs) by the United Nations. Mar Menor's muds are famous for their therapeutic properties. Apart from Mar Menor, the Murcian coast from the historical city of Cartagena to the frontier with Andalusia, that corresponds to the Mediterranean Sea (colloquially Mar Mayor or Big Sea) alternates wild and unspoilt rocky areas with large sandy beaches, with the towns of Mazarrón and Águilas standing out. The tourist needs have forced the area to add all kinds of facilities and services. The construction boom shows the huge amount of estates, including the controversial holiday resorts of Polaris World and second residences, as well as numerous malls. Thanks to the geography and climate of Murcia, these lands are suitable for golf courses, a fact that has been very controversial because of the need for water, which Murcia lacks being a very dry region. Other services includes charter nautical, yacht facilities, golf courses, adventure tourism companies, sports federations, tourist routes, guided visits, excursions by sea.